I came up with Zane and the Wild Zoobots almost by accident. As I was making my third round of edits on Old School Evil, I needed a scene with a hero in it. So far in the story, the only characters that had appeared were either the villains from all these cartoons or their children and I had to change that. I made up a character that was the son of a hero, watching over one of the villain's kids. I wanted him to be an over-the-top hero cliché, wearing the costume and using the abilities passed down by his father in broad daylight. I came up with a cartoon similar to the Centurions, where the character has a costume covered in ports where gear could plug in. But instead of just using various mechanical pieces, I gave the hero robotic animal companions that could disassemble their bodies and become weapons to the wearer. The character in the book became Zeb, titular hero Zane's son, who runs around with the last remaining Zoobot, Cobalt Claw. When it came to the production bible, I decided to add Zeb in (unlike most of the children characters in the book who played no part in their fathers' careers), and I took a lot of inspiration from Scott Trakker and T-Bob from M.A.S.K. I had such a fun time with the concept, I built two teams of four Zoobots each for Zane and his nemesis, Trapper, (both Lead Tentacle and Titanium Horn belong to Trapper) and I really can't wait to create toys based off their designs. While working on the models for the two Zoobots that appear in the big image up top, I wasn't able to build them to the toy specifications, but I'm planning on it someday soon - I really can't wait to play with them on my desk one day. Zane Wilson was a biologist that volunteered at a zoo giving tours for children. He and his partner, Mark Trapper, found out a way to mind control animals and while Zane was against using it, since animals should have regular lives, Mark suggested using them to control powerful animals just like we do with horses and dogs, suggesting they could accomplish so much more. He eventually used the device to control some animals to ruin Zane’s life. Zane, with animals he trained himself, was hurt in an accident and he was able to build robot bodies to transfer their minds into, giving them speech and increasing their intellect. Trapper did the same to the animals he controlled to conduct his nefarious schemes. Zane and the Wild Zoobots means to show kids how animals, no matter the size or behavior, are living creatures and should be treated with respect and dignity. Zane will always respect the Zoobots’ rights by never putting them in dangerous situations against their will or forcing them to do anything they are not comfortable. In comparison, Trapper will force his animals to do his bidding through threats and abuse. In turn, his companions will be angry and bad-tempered. 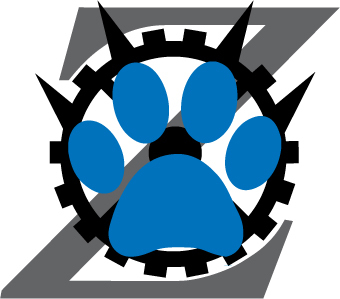 Trapper's animals are never to be called Zoobots, that is a term reserved for Zane. Trapper's can be called robotic animals, robots, or animals. Though the show will not outright advocate for a vegetarian lifestyle, it will be suggested through Zane’s vegetarian choices. Zane – Zane is an animal-lover at heart – every animal from the smallest insect to the largest elephant. He fights for their rights against any ill-treatment, whether it’s abuse or neglect or being over-worked. Zane stands vehemently opposed to Trapper’s taking advantage of his animals, and tries to turn them against Trapper whenever possible. Zane works from the zoo as a volunteer giving tours to children and also owns a small farm where he help rehabilitate animals that have been injured or illegally taken from their homes and kept as pets. Cobalt Claw – A blue puma. She’s sly, sneaky, but loves to cuddle. Can transform into foot-mounted jump boots or hand-mounted claw gauntlets. Titanium Talon – A dark grey eagle. He’s always ready for action – fastest of the crew when he’s flying and when he wants to fight. He can turn into a winged backpack or an arm-mounted shield. Chromium Fin – A white dolphin. She’s the most playful and happiest and usually ready with a joke. She can turn into a jet turbine – she isn’t around much since there’s not a whole lot of water stories, so she doesn’t have a second mode. Osmium Antler – A silver elk. He acts like royalty and often acts as if he’s above getting dirty, although he will do what needs to be done when absolutely necessary. He becomes a back-mounted booster pack where his antlers become compressed air boosters or can become an arm-mounted claw weapon (with the rest on his back, though it loses its boost ability). The boosters don’t allow him to fly, but to run fast. Zeb – Zane’s son, introduced in the second season. He’s incredibly excited to work with his father and the Zoobots. His over-eagerness often gets him in trouble. Tin Tuner – A green turtle. He’s very concerned with Zeb’s well-being and tries to keep him out of trouble, but doesn’t do the best job. He converts into a go-kart.